Sites > MOULAY-BOUZERKTOUN.INFO > Courses > The Right of Way on Waves. Who has priority? abderazaq2 4.2.2019 Courses, Equipment for rent, News, Services, Video Tutorials, Wind and waves big waves, rules, The Right of Way on Waves, wave riding rules, Who has Priority? 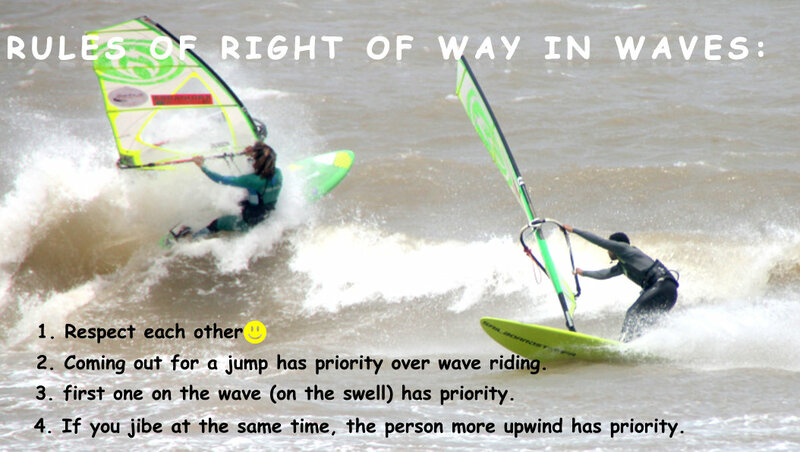 In windsurfing, the rules of right of way in waves are very simple but keep in mind that when you get to a flat-water spot, the rules of right change and you’ll have normal Port and Starboard rules, for example, right hand closest to the mast = You’re on ‘Starboard Tack’ and you have priority. – Those going out through breaking waves have right of way over those coming in – regardless of what tack they are on. – The first one on the wave (on the swell) has priority. – If you jibe at the same time, the sailor more upwind has priority. – Don’t ‘drop in’ on others already on a wave. Dropping in is the act of climbing on a wave that someone else is already riding. Doing this can lead to land on top of other sailors, and it’s very dangerous. – Windsurfers have no priority over swimmers, surfers, and bodyboarders. Remember that other sailors may not know the rules, so respect each other and play it safe. Just like road traffic, there is also a need to take care on the water. If you’re heading for an unavoidable collision, always try to head upwind! This reduces speed and especially if both boards steer upwind in a head to head, it means the boards make contact and the sailors fall back into windward! If you both bear away, boards and bodies collide and that’s not good!